How Is Cpk Calculated When the Subgroup Size Is 1? 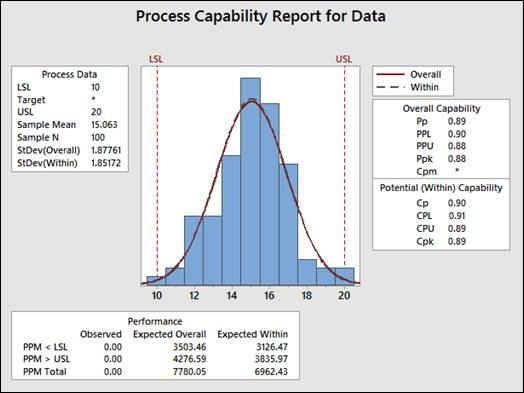 When data are collected in subgroups, it’s easy to understand how the variation can be calculated within each of the subgroups based the subgroup range or the subgroup standard deviation. When data is not collected in subgroups (so the subgroup size is 1), it may be a little less intuitive to understand how within-subgroup standard deviation is calculated. How does Minitab Statistical Software calculate within-subgroup variation if there is only one data point in each subgroup? How does this affect Cpk? This blog post will discuss how within-subgroup variation and Cpk are calculated when the subgroup size is 1. For this post, the data linked here will be used with along with a lower spec of 10 and an upper spec of 20 (sorry, no back story to this data). 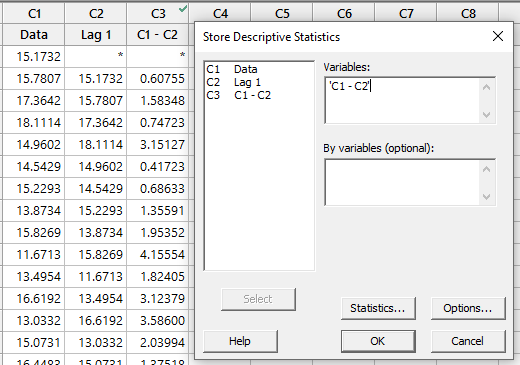 We will also accept Minitab’s default method for calculating within-subgroup variation for when the subgroup size is 1, which is the average moving range. 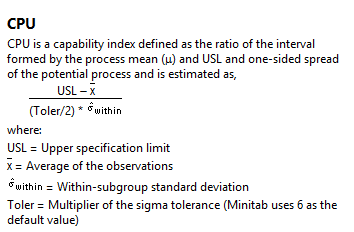 We’ll use the formula above (and link to the table of unbiasing constants) to replicate Minitab’s Cpk output for a normal capability with a subgroup size of 1. 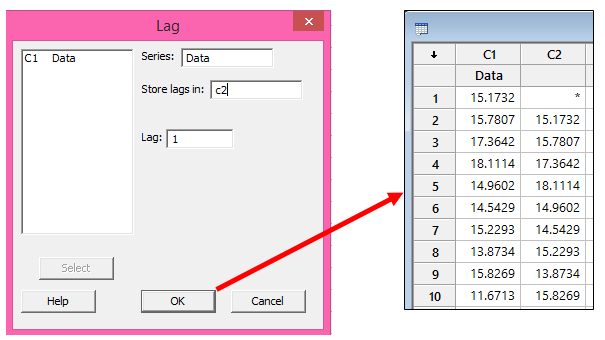 The lag function shifts every row down by the number of rows we type in the Lag field above. 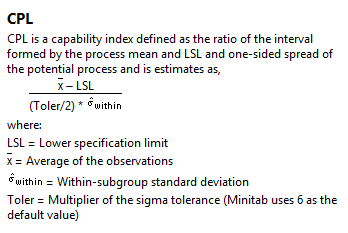 Sigma x-bar = 2.08874/1.128 = 1.85172 – that matches Minitab’s capability output, so we’re almost there! Since Cpk is the lesser of CPU and CPL, then Cpk = 0.89, just like Minitab said! I hope this post on calculating Cpk when the size of the subgroup is 1 was helpful. 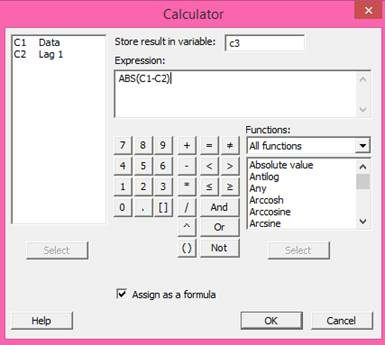 You may also be interested in learning how Minitab calculates Cpk when the subgroup size is greater than 1.